Prada Spring Summer 1997 campaign photographed by Glen Luchford. Image courtesy of Prada. Satin bra, jacket and trousers from The Row Spring Summer 2016 collection. Image via Vogue, courtesy of The Row. I love this red silk satin pouchette by The Row. It looks like a flower. The kimono style opera coat by Samuji will take all my outfits to the next level. Instead of orange, I pre-ordered it in navy. 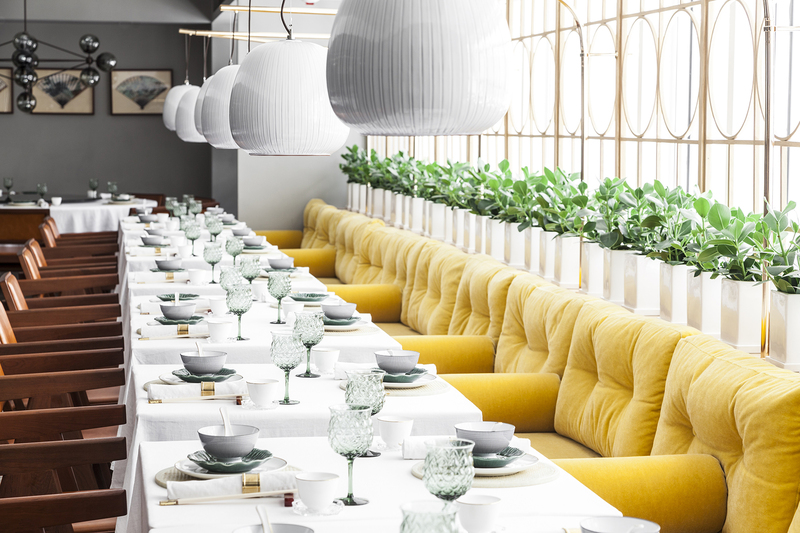 Lunching at Duddell’s in Hong Kong, I could not take my eyes of the yellow velvet seating that managed to be surprising and totally in harmony at the same time. Mind-blowing dim sum, too. As for the home, I have some spare velvet fabric that I could use for re-upholstering a chair or making seat pads for the brushed aluminum Navy chairs in our kitchen. I like the combination of soft and hard textures, glossy and matte finishes in this kitchen.